Pay 3 Get 4. This set contains 4 pieces Extreme Pinot Noir. The diamond-shaped machine-made Pinot Noir glass of the eye-catching glass collection Extreme is offered as an attractive value gift pack - Pay 3 Get 4. Ideal to give as gift or to enjoy yourself. The shape of the bowl supports peatiness flavor and the taste of plum of these sensual red wines. The Extreme glasses derive their name from their extreme contours. 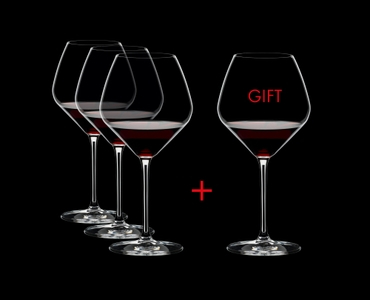 All RIEDEL glasses are dishwasher safe.